Calm + hydrate + renew. Bring good skin back and celebrate your hydrated, poreless look! 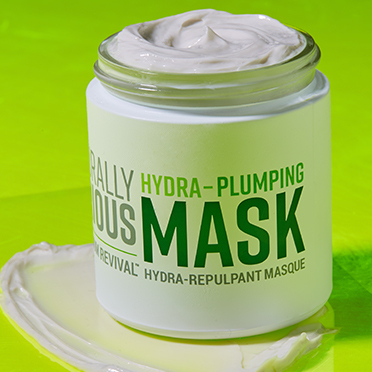 This treatment mask contains sodium PCA and hyaluronic acid to plump the look of skin with moisture, and soothes skins appearance with colloidal oatmeal. The multifunctional formula also includes kaolin clay to dissolve excess oil and impurities. Utilizes a patented Anti-Pollution Blend of 6 anti-oxidants (pomegranate, goji berry, grape seed, green tea, red tea and white tea) to help combat visible signs of aging caused by UV rays, pollution, free radical damage and other environmental aggressors. An exclusive Active Rescue Complex (edelweiss, imperatoria, swiss stone pine and ViaPure Coleus) and rice bran leave skin appearing brighter and renewed. Gently absorbs excess oil and impurities. Help soften and soothe dry, dehydrated skin. Helps attract and retain moisture to hydrate and plump the look of skin. Water/Aqua/Eau, Kaolin, C9-12 Alkane, Glycerin, Caprylic/Capric Triglyceride, Butyrospermum Parkii (Shea) Butter, Glyceryl Stearate SE, Cetearyl Alcohol, Magnesium Aluminum Silicate, Propanediol, Stearic Acid, Pentylene Glycol, Aspalathus Linearis Leaf Extract, Camellia Sinensis Leaf Extract, Lycium Barbarum Fruit Extract, Punica Granatum Extract, Vitis Vinifera (Grape) Seed Extract, Leuconostoc/Radish Root Ferment Filtrate, Pinus Cembra Wood Extract, Colloidal Oatmeal, Allantoin, Ceramide NP, Sodium Hyaluronate, Tocopherol, Sodium PCA, Palmitic Acid, Coleus Barbatus Root Extract, Leontopodium Alpinum Extract, Peucedanum Ostruthium Leaf Extract, Sodium Phytate, Maltodextrin, Coco-Caprylate/Caprate, Cetearyl Olivate, Cetearyl Glucoside, Sorbitan Olivate, Linoleic Acid, Lecithin, Phytosteryl Canola Glycerides, Oleic Acid, Triolein, Phenethyl Alcohol, Limonene, Linalool, Citral, Citronellol, Geraniol, Fragrance/Parfum*. Apply a generous layer to clean, dry skin and leave on for 10 minutes. Remove with warm water and pat dry. Use 1-2 times a week a or daily for more intense repair and hydration.